Ability to design, implement, diagnose and repair simple electrical and electronic circuits which conform to all applicable safety standards. Ability to trouble-shoot and repair both simple and complex hydraulic circuits. Responsible for preventative maintenance for specified area. Understand, comply & implement the health, safety, and environmental policies and regulations. Perform all functions in accordance with the Quality System work instructions. Maintain adherence to Company policies, safety/ergonomic standards, and good housekeeping practices. Flexibility to work other shifts including unexpected call-in’s due to business need. A valid driver’s license is required to operate fork trucks (if applicable). 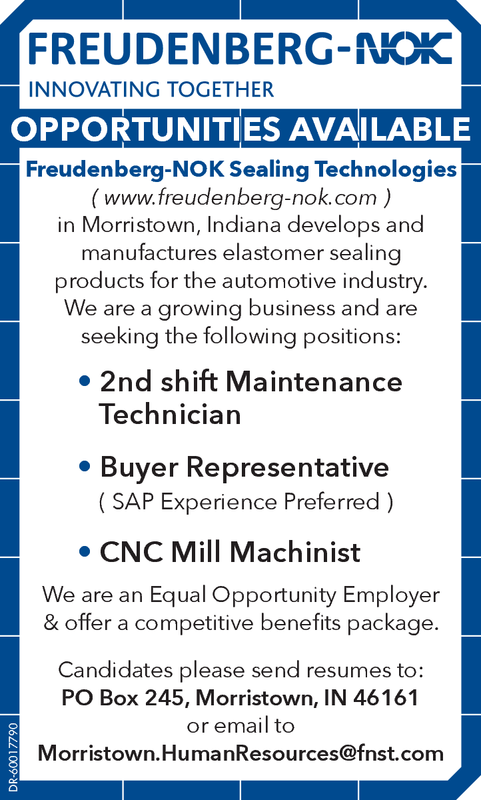 Freudenberg-NOK in Morristown, IN is part of a global manufacturing company leading the world in special sealing technology with a focus on producing applications for the automotive industry. INNOVATING TOGETHER. Creating innovative products together with colleagues, customers, and partners and exploring new paths. As a leading technology group—this is what moves us. More than 48,000 employees in over 60 countries strive for solutions that support sustainability. Our world is growing closer together and changing rapidly. Do you feel ready to rise to new challenges and to seize opportunities? Do you want to contribute to designing the future with us? Join the Freudenberg Group and become part of our intercultural and interdisciplinary team.